A Japanese probe on Friday successfully launched an explosive device at an asteroid to blast a crater in its surface, from which it is planned to scoop up material that could shed light on how the solar system evolved. 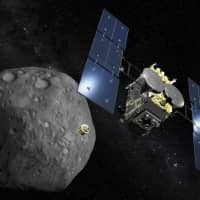 The Japan Aerospace Exploration Agency (JAXA) said it was the world’s first such experiment on the asteroid Ryugu, after confirming in images sent from JAXA’s Hayabusa2 probe that blasted debris had risen from the asteroid’s surface. The explosive mission aiming to reveal more about the origins of life on Earth is the riskiest yet attempted by the Hayabusa2 probe. Hayabusa2 released the “small carry-on impactor” (SCI) — a cone-shaped device capped with a copper bottom — as scheduled, as the probe hovered just 500 meters (1,650 feet) above the asteroid Ryugu. The impactor later exploded as planned, propelling the copper bottom toward Ryugu, where it gouged a crater into the surface of the asteroid that spins 300 million kilometers from planet Earth. Hayabusa2 moved smartly away from the area to avoid being damaged by debris from the explosion or by colliding with the asteroid. While doing so it successfully released a camera above the site of the detonation that was able to capture images of the event. The successful release of the camera sparked jubilant applause at Mission Control. At the time it was unclear when the first confirmation of the mission’s success would come. 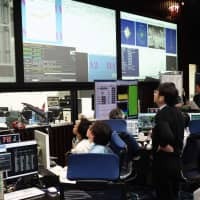 It will take two weeks for the probe itself to return to its “home position” near Ryugu after the detonation and impact. 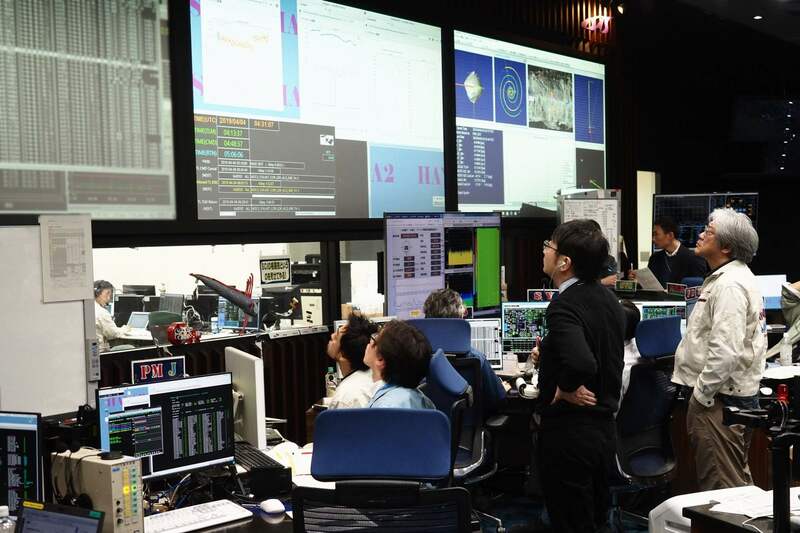 “It is a challenging mission, but we have made thorough preparations for it,” said Takashi Kubota, a professor at JAXA’s Institute of Space and Astronautical Science, during a morning news conference. “I leave the rest to fate,” he added. The size of the crater is yet to be confirmed, but it could be as large as 10 meters in diameter if the surface is sandy or three meters across if it is rocky, according to JAXA scientists. NASA’s Deep Impact project succeeded in creating an artificial crater on a comet in 2005, but only for observation purposes. The asteroid is thought to contain relatively large amounts of organic matter and water from some 4.6 billion years ago, when the solar system formed. The Hayabusa2 mission, with a price tag of around ¥30 billion ($270 million), was launched in December 2014 and is scheduled to return to Earth with its samples in 2020. Photos of Ryugu — which means “dragon palace” in Japanese and refers to a castle at the bottom of the ocean in an ancient Japanese tale — show the asteroid has a rough surface full of boulders. Hayabusa2 observes the surface of the asteroid with its camera and sensing equipment but has also dispatched two tiny MINERVA-II rover robots as well as the French-German robot MASCOT to assist with surface observation. At about the size of a large fridge, Hayabusa2 is equipped with solar panels and is the successor to JAXA’s first asteroid explorer, Hayabusa, named after the Japanese for falcon. 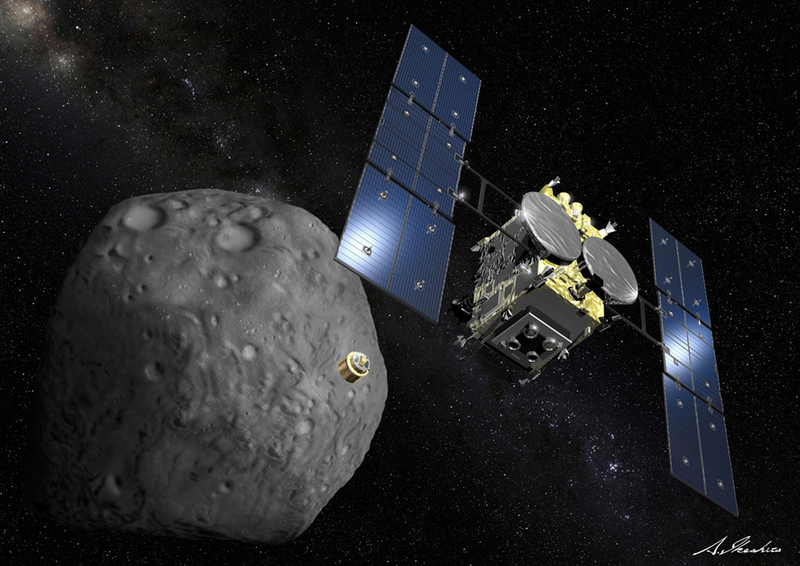 That probe returned with dust samples from a smaller, potato-shaped asteroid in 2010, despite various setbacks during its epic seven-year odyssey, and was hailed as a scientific triumph.